Earlier this year, a formerly well-known banker, doctor of science, journalist and writer Rustam Usmanov who had already served 14 years in prison has been sentenced to additional 5 years while still in jail. His family and even his own defense attorney have learned about this post factum only. Desperate to see his father released any time soon, Rustam Usmanov’s son has addressed the president of Uzbekistan in an open letter describing some of the previously unknown details of his father’s conviction. A short abstract from the letter is published by Fergana in English. It is my father’s conviction and belief that that everything he has achieved he owes to you. He also believes that some people have ill-intentionally created an impression that he could be your opponent and even an enemy. Indeed, as a person who had been openly criticizing governors of provinces and other high ranking bureaucrats he was truly a stone in a shoe for many people who then had made an effort to misrepresent him as your foe. Even though I realize those people are very influential, I nevertheless want to try to persuade you that my father has never been your enemy and has never been opposed to you. I would like to go back in time and explain the details of his arrest and conviction exactly the way my father told me. As you may recall, in 1992 my father had set up the very first private commercial bank in Uzbekistan, following your own proposition. Soon after that, a person had approached my father on your behalf and suggested that my father should “express his gratitude” to the city’s authorities. Without any further ado, my father had donated 15 apartments and 15 villas to the city. Some time later, the same person offered, again on your behalf, a seat in the national parliament in exchange for 10 million dollars. The offer was accepted by my father on a condition of a personal meeting with you, whereupon he was prepared to give the required amount. In a matter of just few days after that, the father’s nomination to the parliament had been revoked, his banking license cancelled and, on top of all, he had hardly escaped an assassination attempt. Having no chance to vindicate his reputation, he was forced to flee and escape in Kyrgyzstan. In February 1998, he received a phone call proposing some meeting in Tashkent. 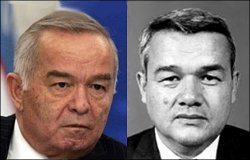 Upon arrival to Tashkent, however, he was arrested, and finally convicted in October 1998 by judge Imamov (who later confessed he had no other choice). It was clear then that a very influential person was keen to put my father in jail, that same person who was obviously interested in misrepresenting my father as the enemy of the state and of the people, as well as the enemy of president Karimov.